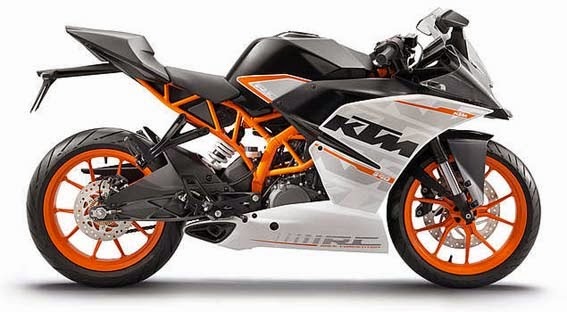 2015 KTM RC 390 Specifications - KTM RC 390 is designed for lovers of motor sport with power, acceleration, balance, comfortable riding position, weight of the vehicle lightweight and body full fairing a sporty and aggressive. 2015 KTM RC 390 is equipped with engine capacity of 373.2 cc, 1 cylinder, 4 stroke, air cooled mated with a 6 speed transmission. The machine is capable of producing a maximum power of 32 kW (43 hp). The compact underbelly, three-chamber silencer is positioned close to the bike’s overall centre of gravity. This aids the centralisation of mass and prevents accidental contact with the rider’s and passenger’s legs. With a power/weight ratio of 0,2kW/kg RC390 is right at the limit of the new A2 driver´s license, making the new KTM RC390 the sportiest option for A2 riders. The advanced design wind shield in combination with the aerodynamic optimized motorcycle front ensure incredible wind protection for rider’s chest and arms. The two-part seat offers first class supersport ergonomics with perfect support for rider and pillion. With a seat height of 820mm it enables the rider to have a secure stance whilst also being high enough for sporty use and real big-bike feeling. A brand new steel fuel tank with 9,5l capacity (including 1,5l reserve) has been developed for the RC, perfectly matching the supersport style and vehicle design, together with rider ergonomics. Thanks to the economic engine the RC achieves impressive efficiency even when ridden hard for a considerable distance. Brand new clip on handlebars and switches contribe to a sporty and aggressive riding position combined with advanced control. As a special feature the RC incorporates blinkers into mirrors structure, which not just looks very sporty but also contributes to the perfect aerodynamics. Brand new twin headlight opens a new direction for KTM style and perfectly matches with the racing supersport look of the RC. The state-of-the-art, liquid cooled, single-cylinder four-stroke 375ccm engine with twin overhead camshafts, four valves and electronic fuel injection, already equipped in the Duke 390 provides outstanding power and thanks to the balancer shaft, delivers the highest level of smoothness. Because of the KTM-typical compact design with stacked transmission shafts the engine has an unbelievable low weight of 36kg. Combine that with technical details like a forged piston, Nikasil-cylinder-coating and forced feed lubrication with power-promoting body-evacuation and you get an engine which provides a remarkable 44hp. The engine is equipped with an electric starter powered by a 12V/6Ah battery. In order to make no compromises in terms of supersport look the KTM engineers integrated the pillion seat into the bodywork lines so that it looks like a real racing bike tail, but ensuring excellent comfort for the passenger. KTM developed in cooperation with Brembo a powerful and easy to control brake-system which allows the rider to be always in control of the RC. A four piston radially bolted caliper in combination with a single brake disk (300mm diameter) in the front and a single piston floating caliper with a single brake disk (230mm diameter) for the rear wheel guarantee excellent braking response even under the most extreme conditions.